1/2 cup coconut milk yogurt- see recipe HERE. 1) Sauté ginger, cayenne, jalapeno until softened and aromatic. Add garlic and sauté until slightly browned…about 3 to 4 minutes. 2) Add stock and simmer a few minutes. Add spinach, cover and let cook a few minutes, then stir to mix onions and spices well with spinach. 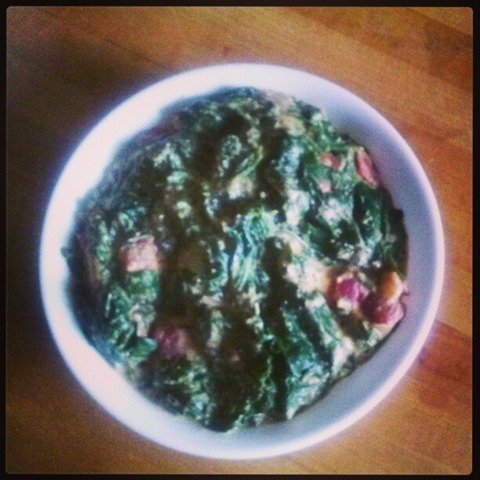 3) Cover again alt let cook a minute or two, until spinach is wilted and bright green. 4) Remove from heat and stir in yogurt a little at a time to keep it from curdling. Serve immediately.